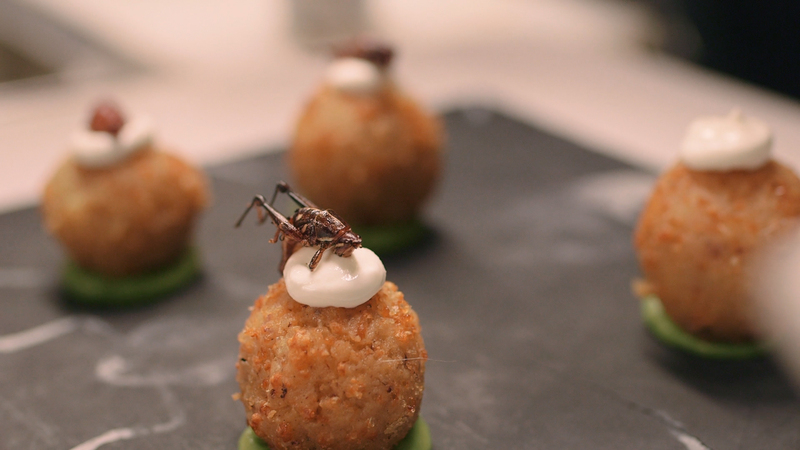 Johanna B Kelly and Cameron Marshad are the producers of the award-winning Andrew Zimmern documentary, The Gateway Bug, which will be screening at this year’s Melbourne Documentary Film Festival. We had the chance to chat to Johanna and Cameron about the film, and their experiences working in the documentary scene. For the chance to check out The Gateway Bug, and other fantastic documentary films, head over to the Melbourne Documentary Film Festival website to grab your tickets! CM: I’ve always been a fan of film but my interest in actually making films became much stronger when I started shooting more street photography in New York. Before working as a freelancer in film in New York, I worked a number of office 9-5, and I’d spend my time walking to and from work taking photos. The most enjoyable parts of the day were the mornings and evenings going to and from work, especially when one of my offices was located in midtown Manhattan, which made for a brisk hour and half round trip photo excursion along a route I could eventually walk blindfolded. That process of taking hundreds of photos every week made me consider what a career change to photography/filmmaking would look like. JK: I have a Masters in Interior Design and worked as exhibition designer at the National Gallery of Victoria in Melbourne Australia for 6 years before deciding to try my hand at being a production designer / art director for film and TV. Because the industry is a lot bigger in America I decided to start my journey in NYC. I went from being a set decorator on my first feature film to Production Designer on my second (Like Lambs), 7 films later I’m now a producer / writer / director / production designer and I love the ability to wear many hats and really drive a project from multiple angles to create whole new worlds for others to enjoy. CM: Experiencing everyday life. Putting myself in situations I’m not normally in, or not used to. Being in those situations is usually what inspires me most. In terms of taking cues from other filmmakers’/photographer’s style, I have to say Errol Morris, Adam Curtis, Garry Winogrand, and Robert Frank. City-life is a pretty big influence of mine, living in a melting pot, experiencing so many different noises, sounds, situations and interactions with people on a daily basis. JK: If you mean film influences I love Martin Scorsese, the Coppola family, Adam Curtis, Wes Anderson, PT Anderson, David Lynch, Michel Gondry, Quentin Tarantino, documentaries and music videos. The Holy Mountain was a game changer for me in terms of movie dreams come true. I stumbled across it screening at MoMA PS1 one Summer, was mesmerised and forever more dreamed of making my magnum opus combining art, music, fashion and spirituality in a similar movie form. I’m actually in the middle of writing it currently. If you mean in general – Hunter S. Thompson, Peggy Guggenheim, Larry David, Haruki Murakami, Ishmael and David Bowie. I love travelling – extensively, ideally off the beaten path, good music (especially old stuff like 50s & 60s soul and the blues), design, architecture, fashion, fine art, particularly contemporary art, food – eating it, growing it, making it, sharing it; reading – as a filmmaker every book turns into a movie in my head so I’m always dreaming up new screenplays based on amazing stories and wishing there were more production funds at my disposal! CM: I’ll speak to documentary making specifically. I really enjoy being on set, shooting on set or on location. I also enjoy assembly in the edit suite. I think those are the exciting moments where everything in terms of character and story come together – because you can be there and capture everything you think is relevant and then you can go and watch the same clip 10 times and it’s completely different within the context of your assembly. JK: That’s a tricky one – each stage has it’s pros and cons. I love pre-production because at that stage everything seems so possible and it’s when you get to be super creative without immense pressure, freewheeling creativity is awesome and building a dream is truly satisfying. Pulling together a great group of people is fun too – building a crew is kinda like party planning, each person needs to be great as an individual but also work well as a team player and bring something different to the table. Production is pretty cool too, having a great team around, especially if it’s working well and you’re all functioning like a family with lots of love and support can be energizing in a way you really need on set – I’ve been on some great crews. But then you have the horrific hours, bad food, long weeks and time away from home so it can also be pretty draining. Post is satisfying because all films really are made in the edit suite – the possibilities are endless. Which can be simultaneously inspiring and daunting but I’d definitely say by that stage you’re getting tired, the time and money pressures are building exponentially and the reality of the films future resting purely with you (if you’re a producer) can get pretty heavy. CM: I can talk about The Gateway Bug specifically, but I think in general just breaking in as a DP and editor, finding the right gigs, finding the right people to work with, getting enough practice but also getting the right pay without having gone to film school. I know a lot of people who went to film school, and I feel they were at a significant advantage compared to myself when I started doing my first film gigs. I had to start from the ground level learning how to coil cable on set as opposed to in a classroom – so learning and earning at the same time is difficult, it’s very chicken/egg. To that end, making your own project (like The Gateway Bug) is the ultimate challenge, as I’m still very much learning how to make my own film. No one teaches you how to produce, shoot, edit and distribute on your own. JK: Distribution is pretty hard but that’s probably because this is the first film where I’ve been involved in this aspect so it’s my least experienced arena. Also the possibilities are endless and with the recent shifts in the industry it just feels like most people, big and small, are scrambling to figure out new strategies. Finding the right people to work with around the world is a big ask for an indie filmmaker, trying to create publicity around an indie with a micro budget can be tricky too but it seems to be the best way to get your film noticed by people who can help with this side of things. I’d love a mentor but at this stage in the game I realize everyone is kind of at a new starting point given the swift shift to S/VOD from DVD and the sudden influx of streaming services etc. The statistics for women filmmakers are also pretty grim, so trying to stay positive despite statistical evidence that I’m fighting twice or thrice as hard as the majority (male filmmakers), which can be daunting so I try to ignore that and just dance to my own drum. I’m buoyed by the dream that good films and filmmakers rise to the top eventually. CM: In my opinion, narrative arc and character development are the most essential components of a great film. I’m drawn into a film, especially a documentary, if the character and story are there. The camera work could be awful, there doesn’t even have to be music – so long as we’re following an interesting character and they have a good story, I’m in. JK: Character and story. Without those two you have almost nothing but with – everything else is less important. Even without great writing these can still be created through editing sometimes, or helped by design, cinematography and music, but good writing is always going to shine through so it’s helpful to start there. As a long time designer, that saying measure twice cut once rings true even in writing – you really want to go over and over a script before doing anything at all because the weight of every single other department is ultimately using that script as a foundation. CM: They’re too very different endeavors but equally difficult. A feature obviously requires more stamina from all perspectives, on the production side and on the audience side, but short filmmaking requires a specific storytelling and editing style – maybe limited to one location or two characters. Either way, it’s about making compelling characters and story, so I think success with short filmmaking can certainly translate. If you master short filmmaking, why couldn’t you master feature filmmaking? JK: No idea – having only worked on a couple of short films I don’t have enough experience to talk to that subject but I do believe experience in general contributes to success so the more you work the better you’ll get. Practice makes perfect. JK: We engage to the extent of finding our audience and connecting with people who are into what we’re talking about. We met some interview subjects and post collaborators through social media. We’ve made friends with people who ended up putting us up in their town, or collaborating on events we’ve done at premieres – it’s certainly a comfortable space to find like minded people. And while I like the idea that it can help spread the word about the film, I’ve grown up with a punk ethic and I don’t like the corporate manipulation side of it. We’ve watched other filmmakers with more money buy likes or followers and misrepresent themselves on certain platforms and that does leave a bad taste in our mouth… I think VR is more likely to have a bigger impact on filmmaking. JK: The Gateway Bug is an empowering call to action on the currently unsustainable western diet and the dire future it’s set up. We cover everything from global warming and our desire for convenient processed food as it’s biggest contributor, to proactive strategies like aquaponic farming, zero food waste and shifting the diets of animals on this planet as well as humans. Animal agriculture is responsible for 91% of Amazon destruction and 18% of greenhouse gas emissions, (more than the entire transportation industry). Emissions projected to increase 80% by 2050, when Earth’s population is predicted to reach 9 billion. 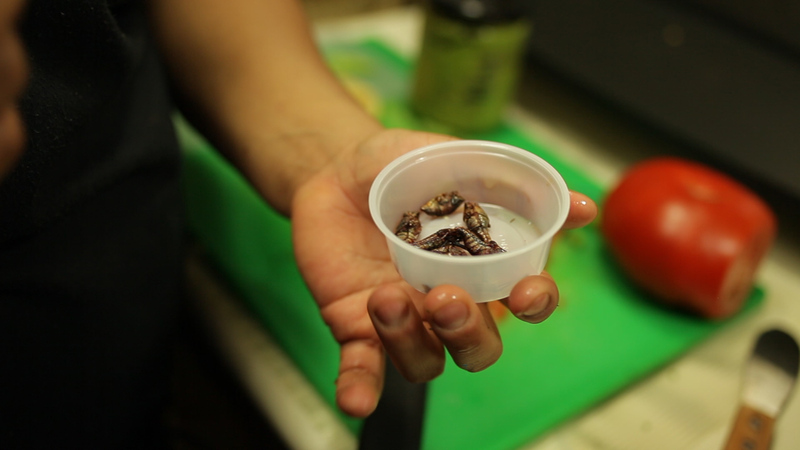 The UN warned in 2013 that food production must thus increase 70% by 2050 to feed all those people but warned that’s impossible and went on to suggest entomophagy as a very viable alternative option. Worldwide, 50% of grain is fed to livestock and therefore feeding livestock insects could reduce greenhouse gas emissions immensely. Insects also release far less ammonia and methane than pigs and cattle, take up far less space, require far less water and pound for pound (feed wise) provide way more protein and because they are cold-blooded, require less energy to stay warm so are more efficient at converting feed into protein. Crickets need 12 times less feed than cattle, four times less than sheep, and half as much as pigs and broiler chickens to produce the same amount of protein. Crickets also have twice the protein of beef, more calcium than milk, all 9 essential amino acids and more iron than spinach! So recent studies show a global shift to an ento/plant-based diet would reduce mortality 10% and cut up to 70% of Greenhouse Gas emissions by 2050. It’s an informative look at what we can do on a personal scale to address these global issues one meal at a time. CM: Joh and I have some doc projects we’re pursuing, but given the nature of documentaries we need to keep those hush hush. I also have a narrative idea that stems from true events from college years – a coming-of-age story. Again, that’s all I can say for now. JK: As I mentioned earlier I’m in the midst of writing a narrative feature script, along with rewrites of a tv show I’ve written and together we’re in the research and development stages on 2 of our next docs but of course we can’t really talk about anything in detail! We are still in the midst of our film festival tour for The Gateway Bug, having just completed the USA leg of 7 festivals in 7 cities in just 3 months, we are now headed to Australia and beyond for the rest of the year. CM: I’d say: develop your own projects. Start with taking photos, shooting video and recording audio on your cell phone, put a story together in iMovie, or whatever you have access to. Get excited about a subject and pursue it. Then, watch other work for inspiration. Once you have ideas, find collaborators who have similar ideas and help them pursue them. I think teamwork and collaboration is incredibly important to making a career in filmmaking work – I know I wasn’t able to do The Gateway Bug on my own, and having a producing partner who was equally, if not more excited, about the subject matter as I was made all of the difference to getting our project off the ground and where it is now. JK: Watch as many great films as possible, learn from them, study them. There’s a great doc called The Wolfpack by fellow female NY director Crystal Moselle showing one family of brothers who analyze everything in their favourite films, from script to costumes to recreate them and I can’t think of a better grounding to become a filmmaker. Tarantino (one of their heroes) is known for his epic watching and look at the gems he’s turned out. I’d also suggest getting on set or assisting producers and directors as much as possible. PA work on a feature film is like a film school degree in 3 months. Work, work, work – that’s how this industry functions and the only way to become a great filmmaker. Interested in more on The Gateway Bug? Check out the film’s Facebook, Instagram and Twitter.